This is a bugfix patch for "Recorder - Standalone Fully Voiced Follower" by potasticpanda. If it's okay with potasticpanda (original author of Recorder), then it's okay with me. Thanks to potasticpanda for making Recorder! Also, for being hilarious on MxR Plays (YouTube). Thanks to MxR for introducing me to Recorder and for helping me to get permission. Thanks to VoidWanderrer for making the Unofficial Recorder Guide. I used this as a reference to find bugs to fix. Forgot to copy most of the new files into the previous release. Fixed. 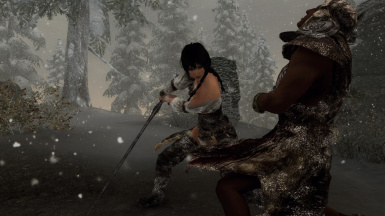 This is a bugfix patch for Recorder - Standalone Fully Voiced Follower by potasticpanda. The intention of this patch is only to fix bugs in the mod, not to add new content. Anything that seems like new content is most likely something that was already there but wasn't previously working. I've tried to make as few "creative" decisions as possible, except to fix problems that are already baked into a save (e.g. added a dialogue option to get a book that fell through the ground and can't be reached). Just install these files over top of the existing Recorder files. The original Recorder mod must be installed first. The patch should not overwrite any files except for Recorder files. It will install a new plugin called Recorder Follower Patch.esp. Recorder Follower Base.esp must still be enabled. For load order (Plugins tab in MO or NMM), make sure that Recorder Follower Patch.esp is somewhere BELOW Recorder Follower Base.esp (i.e. Patch should be loaded after Base). Also, any Recorder compatibility patch must be BELOW Recorder Follower Patch.esp. BUG #1: In the Tracking the Lost Files quest, sometimes files may be trapped under something so you can't click on it. 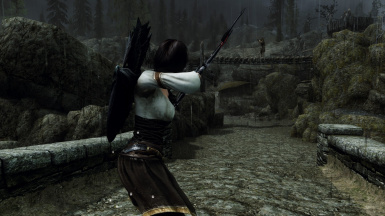 This always happens with Open Cities Skyrim (OCS) or JK's Skyrim installed (if you didn't have the compatibility patch installed when you started the game), but it can also happen without them. Select "I need to ask you some questions." Scroll down to the bottom and select "You know where the files are, right?" Any files that you haven't found already will be reset to their original locations. This works for Open Cities Skyrim or JK's Skyrim if their corresponding compatibility patch is enabled. BUG #2: In the Tracking the Lost Files quest, you're able to pick up the third file (the one in Whiterun) before you're supposed to. If you pick it up too early, then the cutscene doesn't trigger and you can't progress. Since it's a quest item, it should still be in your inventory. Go to the well in the center of Whiterun's market area. Scroll down to the bottom and select "Oh, I already found this file!" BUG #3: After finishing the Tracking the Lost Files quest, Recorder never takes her files back. With the patch, she takes them after you find the last file. If you already passed that point, then you'll have to use this special dialogue option. Scroll down to the bottom and select "Do you want your files back?" BUG #4: In the Tracking the Lost Files quest, the second cutscene doesn't play properly. The wolves are supposed to chase Recorder, but a configuration error prevents it from happening. Select "Let's talk for a bit." Scroll down to the bottom and select "So wait, are we married or not?" (Optional) Added all of the UNP Main Body meshes. Previously, only the *_1.nif versions were included, along with the wrong hands and feet. Meshes are from DIMONIZED UNP Female Body by dimon99. (Optional) Fixed up clipping issues in Pirate Shirt mesh. It's not perfect, but it's a lot better than it was before. Mesh comes from zzjay's wardrobe by zzjay. Added FaceGenData for Past Recorder. This fixes the face bug. Added normal map for Recorder's head. This was originally pointing to the vanilla version of this file, and this could make her face look rough if you haven't replaced it with another mod. File is from SG Female Textures Renewal by Hello Santa. 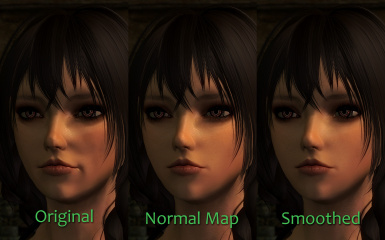 (Optional) Replaced subsurface maps in order to fix the bronze skin bug. Files are from Fair Skin Complexion by HHaleyy. (Optional) Used UNP Texture Blender by Lunrya on body and head textures in order to minimize the neck seam. For Recorder's intro dialogue, if you exit the conversation prematurely, then she won't become your follower and you can't repeat the dialogue. Now you can talk to her again. In the cutscene for the fourth file, I split the lines "And am going the wrong way. Great! CAN THIS DAY GET ANY WORSE?!" and "...aaand I've spoken too soon. RUN!" It still sounds the same, but the subtitles look better that way and the lip syncing is improved. Some of Recorder's random idle lines are set to trigger on the location keyword LocSetOutdoor. Since there aren't any locations that actually use this keyword, the lines are never heard. Now they trigger properly when outside. When you say "I have some questions for you," Recorder is supposed to say one of three random responses, but she was only ever saying the first one. These are working now. There's a chance that the second file will fall through the ground and can't be clicked on. I've moved the second file upwards slightly. Hopefully, this will prevent the file from falling through the ground. For BUG #2 above, the third file will not appear until you've reached the correct stage of the quest. This is how all of the other files work. For BUG #3 above, Recorder will take her files back after you've found the last file and you talk to her about it. Increased the radius for cutscene markers. This hopefully prevents cutscenes from getting stuck because a character isn't standing on the exact right spot. Made all characters in cutscenes ignore combat. This prevents a cutscene character from attacking enemies that happen to walk by. Moved the quest marker for the fourth file. Previously, it would sometimes mark South Skybound Watch and sometimes mark North Skybound Watch. It's now always on South Skybound Watch. For BUG #5 above, after completing the marriage dialogue, the player will now be married to Recorder. There's no ceremony or anything. The Summon Recorder spell will be available after marrying Recorder. Fixed subtitles to match actual spoken lines as much as possible. Fixed spelling and grammar in subtitles. Of special note are the spellings of "Khajiit" and "Sovngarde". Fixed some lip syncing issues. (Optional) Added three options for how often Recorder makes a comment: about every in-game hour (default), every 3 in-game hours, or every 6 in-game hours. If you are using Open Cities Skyrim by Arthmoor, then the third file doesn't appear when it should. This is because the "open" version of each city is actually a different location from the original "closed" version. Arthmoor did provide a way to get into the closed version, but it's not like anyone reads the manual or anything. This patch moves the Whiterun changes into the open version, providing a more seamless experience. If you're using JK's Skyrim by Jkrojmal and Teabag86, then the first file is hidden under the new terrain. This has been moved to the side of the mammoth skull. Also, the third and fifth files have been adjusted slightly. Thanks to Teabag86 for creating and sending me the patch. Thanks to MxR for introducing me to Recorder and for helping me to get permission. See Mega Modded Skyrim - Part 16 featuring potasticpanda AND Recorder! Thanks to Shiva182 for suggestions on improvements. Check out Recorder Bodyslides by Shiva182. 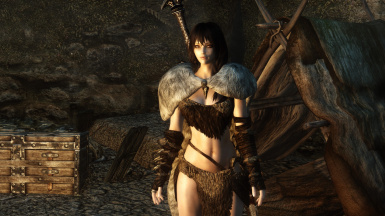 Thanks to Teabag86 for creating and sending me the compatibility patch for JK's Skyrim.